With kindergarten graduation just around the corner and spring fever in full force, I have to find creative ways to keep my students motivated to do their best work and continue following our classroom rules. 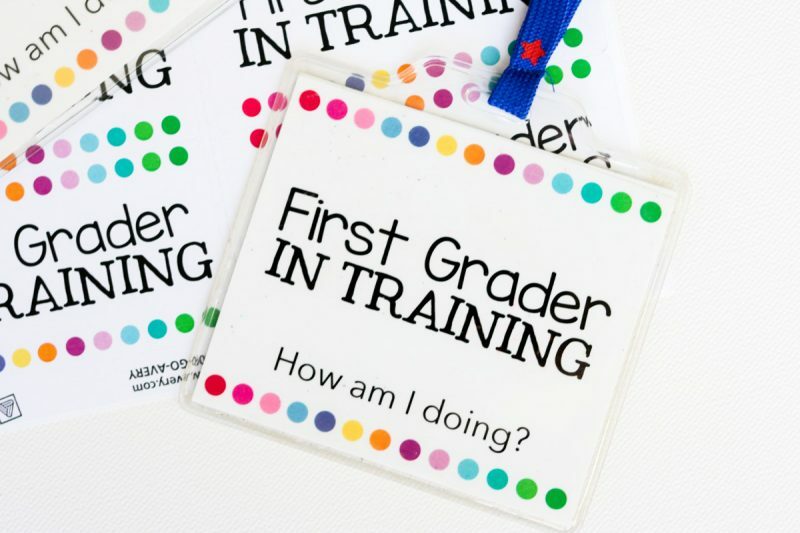 This year I decided to try something entirely new and I gave each child a “First Grader in Training” badge. I actually created free badges for all elementary grade levels. You'll find a link to download the badges at the end of this post. But first, let me tell you how I use these as a motivational tool for my kindergarten students during our craziest month of the year. I created these labels in a moment of inspiration after a long, restless morning with my kindergarteners. All of those little nuisance behaviors were starting to take over. You know what I mean … whining, tattling, interrupting, horseplay, even a few emotional outbursts. Rather than punish my students, we had a little heart-to-heart chat before they went home about how the day went. I reminded the class that they would be first grade students soon and that those kinds of behaviors are not acceptable in first grade. Everyone agreed that they would try to do better the next day. 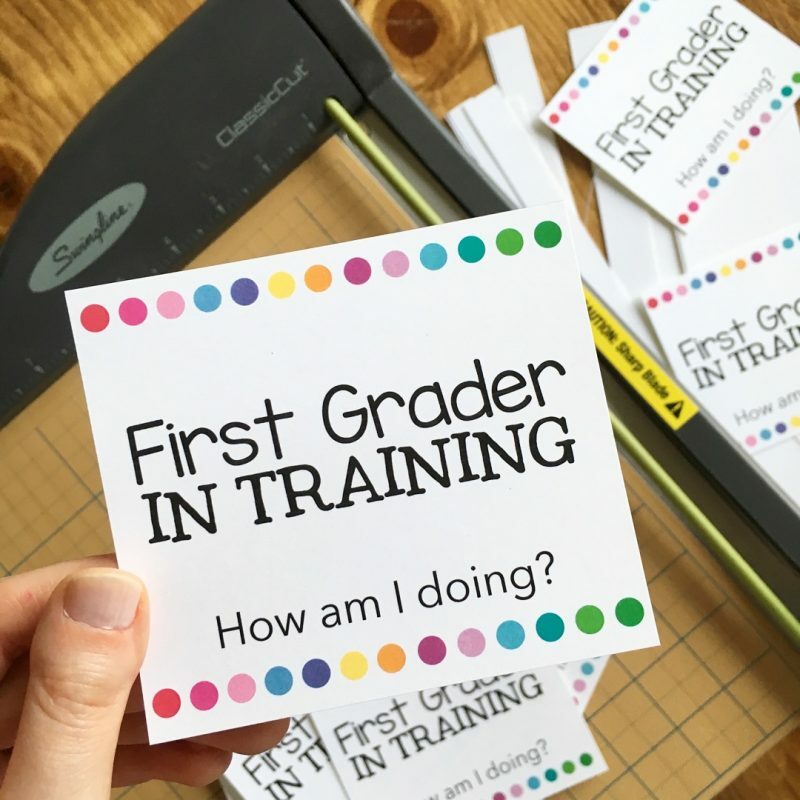 That afternoon, after my students were picked up by their parents, I hurried out of school, sat down and my laptop and created my secret weapon against undesirable behavior: the “First Grader in Training” badge. I snapped a quick photo and shared it on Instagram. Apparently I wasn't the only frustrated teacher that evening because it was one of the most popular photos I have ever shared and it got dozens of comments, questions and multiple requests to make badges for other grade levels. I printed, laminated, and trimmed each badge; then slid the badges into the plastic nametag lanyards that I received as a classroom reward from Highlights magazine a few years back. These nametags are amazingly durable. My students haven't used the nametags since December when we stopped wearing them to our specials classes. 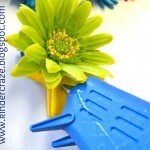 Any classroom tool is only as good as procedures centered around it. So I didn't just hand my kids a badge and hope for the best. Instead, we gathered for a meeting and had a great big chat all about First Grade. We talked about what First Grade will be like and made a concept map all about First Grade expectations. I opened up my laptop, connected it to the projector and typed all of their responses. These thoughts came entirely from my students. I created the concept map on Text2Mindmap.com. It's a free site that creates clean and simple concept maps. I really liked the clean visual details and how easy it was to format and move each element on the map. 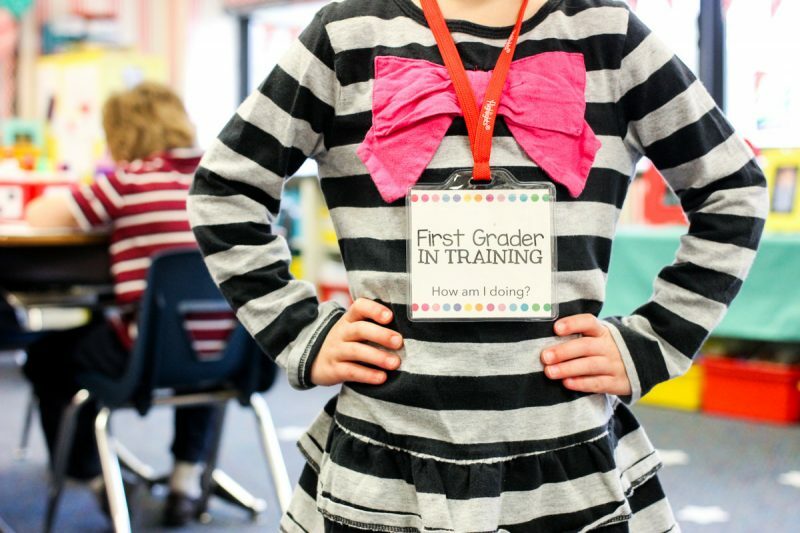 Once the expectations were clearly laid out, I handed each student their very own “First Grader in Training” badge. I made a really big deal about how special the badges are and how they are a visual symbol to everyone in the school that they are working on something really important. All teachers members at my school wear staff badges on lanyards each day. I compared their badges to mine and then my students' eyes really lit up. 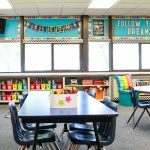 We started something new in my classroom today! My students are officially in training for First Grade. 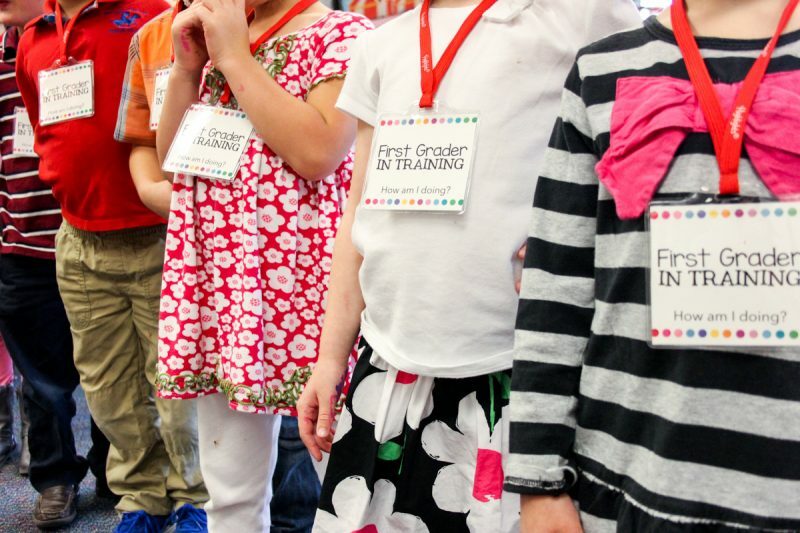 If you see them around school wearing a nametag that says “First Grader in Training”, feel free to comment on what you see them doing! 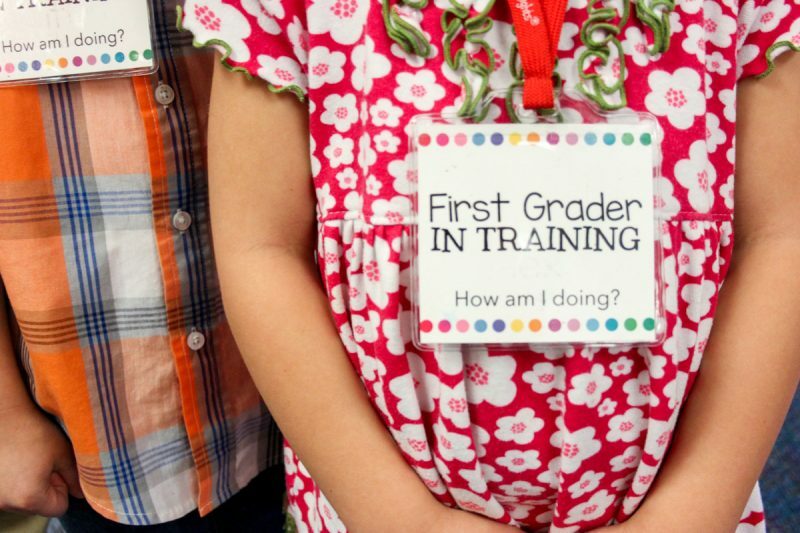 Their little badges say “How am I doing?” and they would love a compliment if they are seen acting the right way. 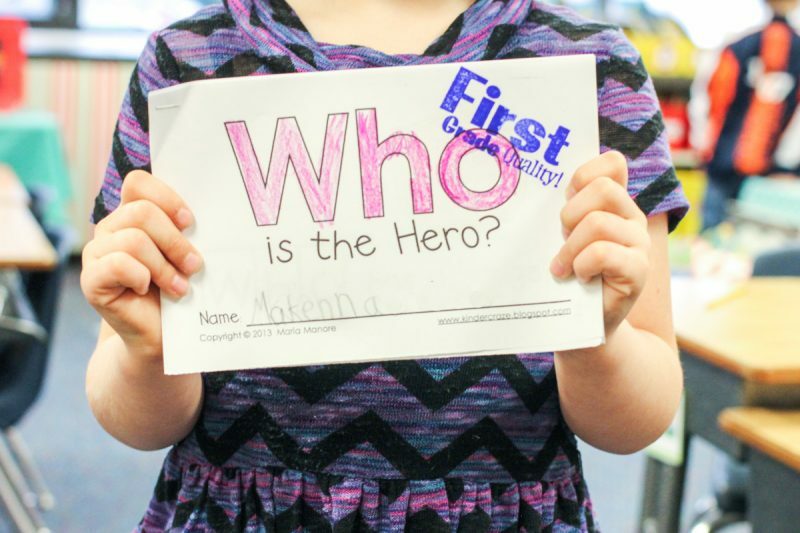 Their teacher would equally love a gentle reminder if you see someone that may have forgotten how first graders act at school. I'm sure you noticed that each badge asks “How am I doing?” That's no accident! The other teachers at my school read my email and offered compliments to my children on their grown-up behavior every time they passed each other in the hallway. It worked wonders for my kindergarteners. They feel extra proud any time a teacher other than myself praises them and all of those extra compliments provided the perfect positive reinforcement for my little classroom management solution. 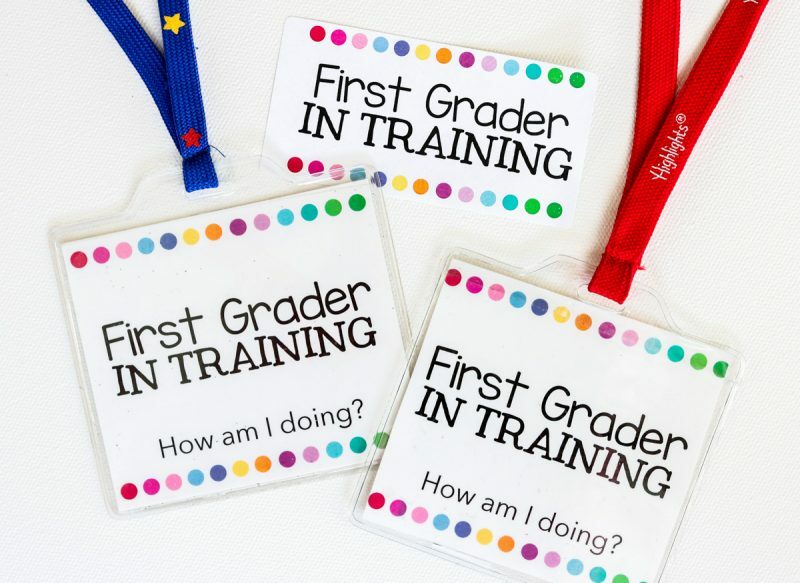 As promised, I created FREE badges to help your students train for multiple grade levels. 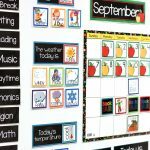 Preschool through 4th Grade teachers can all launch a “training” course in their classroom to leverage all that year-end student excitement and help it work in favor of classroom management. Three different sizes are available in the download. Inserts for red lanyard nametags from Highlights magazine rewards, blue lanyard nametags from Lakeshore Learning and Avery 5163 shipping labels that you can print and stick onto your students' shirts if you don't have any of the lanyard-style nametags. Click the image below to download your FREE student training badges. How Long Will the Magic Last? 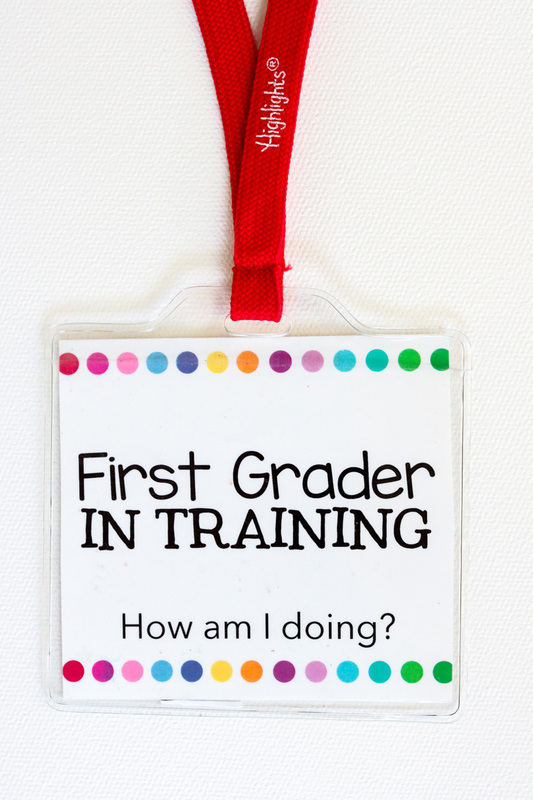 It has been three weeks since I first launched the “First Grader in Training” badges in my kindergarten classroom. As you might expect, the novelty of the badges has worn off. Every single student wore their badges for the better part of two weeks. After two full weeks of wearing badges, the excitement began to wear down. During the third week, only half of the class wore a badge most of the time and by that Friday, nobody in the class wore their badge. Today is the beginning of the 4th week of school since we had our big classroom talk about how First Graders act. My students may not be wearing badges, but I can tell you that their behavior is still notably better than it was before we had the talk. It was worth every moment of my time and energy. 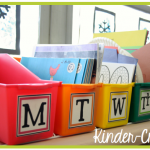 I know that even though our last few weeks of school will feel a little crazy and put my classroom management to the test, it will be far better than the path we were heading on before I got creative. Using the “First Grader in Training” badges in only half of the year-end motivation plan for my students. This tool helps to manage student behavior but it doesn't do a whole lot for their work quality. 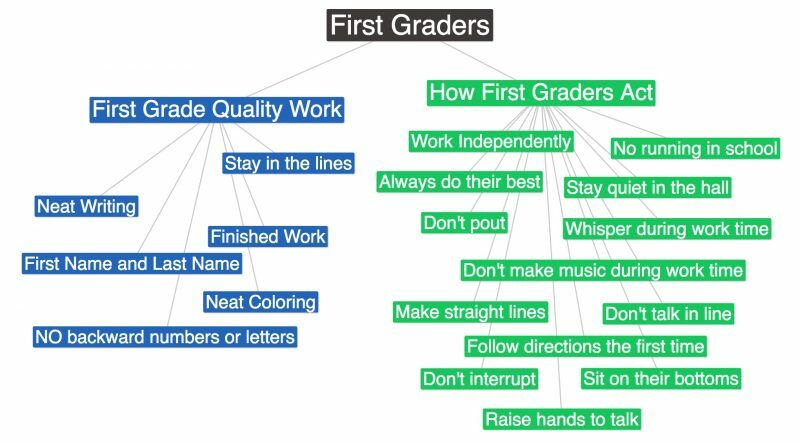 You may have noticed that the concept map we completed in class had a whole section describing “First Grade Quality Work”. I have another trick up my sleeve that I use to encourage quality work from my students during the last week of school and they never lose interest in this one. Read all about it in this blog post. I am in LOVE with these! 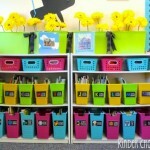 I’m going to use them for my first graders at the beginning of next year though. Thank you for sharing and making for all grade levels. This is so AWESOME!!! I teach first grade and we have the kindergarten kiddos come in and see what first grade is like for an hour at the end of the year. This would be PERFECT to give them! How cute! This is brilliant! We only have 6 days left, but this may be just the ticket to get us through. Thanks!!!! Thank you so much! We have a loooong 20 days left, so this is just what I need as summer fever hits and we are still in the thick of things. Hopefully the magic lasts for at least a little while. Wow! Could you make one that says”dead body in training “? The kids could wear them when it’s time for bed. Awesome! I have been waiting for these! 🙂 Thank you so much for sharing and for making them for multiple grade levels. I love these! Thank you so much for sharing. I am always telling my kinders that they are soon going to be first graders. This would make them feel so special and probably help them complete their work with a little more effort. 🙂 Such a cute idea! The link isn’t working to download the badge. Help! Hi Leah, I’m so sorry to hear that you are having trouble with the download. To access the badges, click the download image at the bottom of the post. When you click it, a popup window will appear asking for your name and email address. Enter your information, then check your email inbox. You will find an email from me containing a link for you to download the badges. If the link itself isn’t clickable, try opening your email in a different web browser. I just tested the entire process and it is working for me.